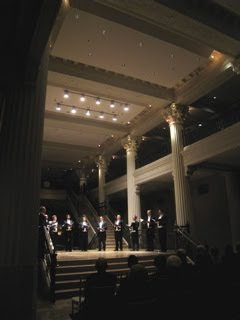 Sometimes people are surprised to find out that Chanticleer is a 501-c-3 non profit corporation with a Board of Trustees which takes on the responsibility of governing the organization and making it possible for us to realize the four pillars of our mission: live concerts, recordings, education, and commissions. Our Board of Trustees is great! They are very committed to ensuring the future of Chanticleer, and they join us here and there around the world to see how it's going. Dr. Susan Carlyle, our Trustee in Houston, along with her husband Dr. Dennis Carlyle and THE caterer in Houston, Jackson Hicks, gave us a benefit party on Friday night at The Corinthian ( formerly one of those magnificent bank buildings which now house beautiful events) - a short concert and a long and friendly (and delicious) candlelit dinner. Trustee Peggy Skornia came from San Francisco to attend. We enjoyed it a lot and we thank Susan for her ongoing support and encouragement and the friendly folks in Houston for coming to see us. We have a day off here tomorrow, then on to Fort Worth for a day of workshops with High School kids, and a concert at the wonderful Bass Hall.